Charming is made from a pink material flecked with glitter. She has large sparkly purple and black button eyes and purple stitching for her nostrils. 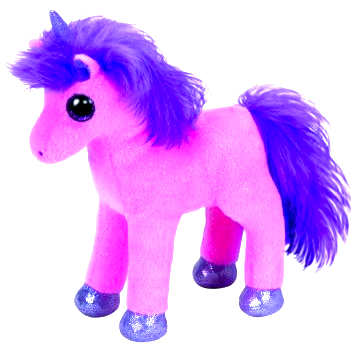 She has a fluffy, purple mane and tail and she has glittery purple material for the inside of her ears, her hooves and the horn on top of her head. You can see unicorn’s along the way. With sparkle trees and glitter streams. Charming was introduced on 1st July 2014. Her birthday is on 24th September 2014. She is the second Beanie Baby called Charming. The first was a pale blue horse released in 2005.